The BellRays are the band that convince the MC5 they'd have been better off in Memphis. 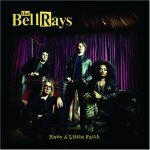 The BellRays certainly aren't the first band to effectively combine R&B and rock 'n' roll (think early British invasion), but they do a better job than most groups of making the resulting music sound more like a mixture and less like a compound. In pulling Detroit's musical past into one place, the group doesn't just mishmash garage guitars with soul vocals; instead they find ways to weld the two influences together. In turn, they're either the most aggressive soul group you've heard, or the punk band with the best vocalist. It's that vocalist, Lisa Kekaula, who you notice first on their new album Have a Little Faith. As soon as she enters on "Tell the Lie", she demands full attention. Her voice is so strong and thick that it would be easy to think the musicians are there only to serve her. She's got a voice that's all her own, with her nearest peer perhaps being Sharon Jones, who lives completely in the soul arena. Based solely on the opener, you might expect Kekaula to follow that route, too, as she brings that big voice over tight lines and a guitar that could have come from a Curtis Mayfield album. Guitarist Tony Fate has his own approach that nicely brings the rock to back Kekaula. The second track, "Time Is Gone" rides on a riff reminiscent of Lynyrd Skynrd's "Saturday Night Special", moving the band more towards rock and more towards the South, landing somewhere around Muscle Shoals (so by now the Los Angeles band has pretty much covered a continent. The soul side of the group leans more toward a southern influence, more Stax than anything Motor City. Even so, the group delivers an intense punk party number called "Detroit Breakdown". That the song shares its title with a J. Geils Band classic only helps to point out how far the BellRays have distanced themselves from rock groups that claimed an R&B influence. Rather than quoting a few James Brown grooves or throwing out some "soulful" vocal inflections, the BellRays just drive an angry guitar into your head until you can't say "soul" or "rock" anymore. They immediately follow it with "Lost Disciples", heading out into space with a tom-led piece of psychedelia that marks the album's low point. The song doesn't give Kekuala the vocal opportunites she needs, nor does it produce the punk spark that the band spits out so well. The following track, "Everyday I Think of You" gets them righted, as they slide smoothly into a straightforward R&B number, with bassist Bob Vennum leading the way by playing an understated line. The song leaves plenty of space, and neither Kekuala nor her back-up singers rush to fill it up. The resulting atmosphere reverses the forced aura of its predecessor, making the room increasingly warmer as the band simmers without calling attention to itself. The band returns to its original soul start most directly a couple tracks later with "Third Time's the Charm", a Fate composition that sounds less retro than genuinely old. The performance feels more like the Apollo than CBGB's, and its late placement on the album serves to hold in the middle rock explorations as a component of, rather than the true source of the BellRay's sound. Closing track "Beginning from the End" teases by starting off with a lounge feel, but then it bursts into the album's most chaotic rip of noise. The group immediately segues into a more chilled R&B moment, and then combines Kekuala's vocals with the earlier guitar and bass noise work. The song varies between the two sides, but always circles around to integrate them. In case you've gotten tired of the soul vs. rock game, the BellRays throw in a brief, vaguely Eastern bridge before erupting. And so the group closes with their own encapsulation of their sound -- there's always something about to happen, and always two schools of music fighting not for space but for complete merger. It's an idiosyncratic approach, but one that's highly successful.